By now many of you will have read our daily "blog" on our activities in Uganda and you will have shared with us some of our thoughts, our emotions and our reflections on those experiences, some will have presented different views but I think you will agree everyone has so far enjoyed their visit and many will already have indicated that they will return, so all in all it has been a positive experience. Sadly though there is another side and sometimes something happens that presents you with a completely different set of emotions like anger, frustration, sadness and a complete sense of helplessness. I have been coming to Uganda for 15 years now and after the first few visits you learn to deal with the unexpected and on the whole you cope with the bits that make you mad or sad but still occasionally those other emotions surface again and you realise how difficult it is to help everyone. Over the last few days quite a few of us have been affected by the plight of one little girl called Sylvia. Sylvia is 18 months old and beautiful. Her parents divorced and shortly after that her Mother died of AIDS. She was at first looked after by her step-mother and it seems she was beaten and caned and generally neglected until her Aunt stepped in and assumed responsibility for her. She has so far never smiled and despite constant attempts to get her to do so we have all failed. She is content to be cuddled all day by any of us and never makes any attempt to leave us but just nestles close to us with this pathetic blank expression on her face. Her clothes are filthy and she needs a wash and her nose seems to be running all the time. Every day she walks the short distance to Bukeka School where our dear friend Livy, the Director of the school, insists she is looked after and fed a cup of porridge (millett and maize flour mixed with water) but she never plays with the other children and just walks around looking lost and sad. At the end of the school day the teachers make sure she is returned safely to her Aunt. That evening when we returned to Mityana we bought her a new dress and some pants and in the morning on arrival at Bukeka we dressed her in her new clothes. There was little in her face to indicate any reaction to these beautiful new clothes but she looked lovely. Whilst dressing her Gertrude, the Head teacher said she was very hot and running a temperature, her tummy was swollen and tight and it was agreed that she should visit the clinic. Not far from the school was a state run children's clinic which is where I thought we would be going but Gertrude explained that there would be no medication for her here so it was better to take her to the local clinic just across the road. We entered a little shack like building and were invited to sit down on one of two settees by the lady who obviously lived there. Gertrude explained that she was the local midwife/nurse. Whether or not she was officially qualified to treat patients or deliver babies I have no idea but I suspect not. However she did appear to know what she was doing and as I watched her work it was clear that she was doing her best to maintain a clean environment. Two ladies were waiting on the other settee for their turn. There was a little table in the centre, covered with a clean tablecloth and napkins. At the front of the building was a large wooden table with drawers either side and on the table were various items such as a bottle of meths, some plastic boxes containing syringes and needles, other boxes with pills in, some capsules of medication for the syringes, a box of condoms and a book for recording the various treatments administered, there was also a pot with used needles being sterilised in the meths. To the side of the table was a large cupboard which seemed to be full of a variety of medications in tablet and liquid form, some of which were vitamins. After counting out (but not touching them with her hands) some tablets for one of the two ladies they left and it was Sylvia's turn to be seen. A digital thermometer was put under her arm and her tummy and skin was felt for temperature and tightness. She wasn't too happy about this but made little fuss. Two injections were then prepared. A sterile needle was used to draw up the liquid from the capsule and the needle was then changed for one of those steeped in the meths. Cotton wool was soaked in the meths and one buttock was swabbed and then injected at which Sylvia screamed and actually fought - the first time I had seen her react to anything. It was a repeat performance in the other buttock after which the thermometer was removed indicating she had a high temperature. Some tablets were then prescribed, counted and placed in 4 separate envelopes, again without touching them, and we were told she was to be brought back in 8 hours time for another injection. At the time of writing I have no idea if this was done. All of this was recorded in the book I mentioned earlier, we paid 6000 shillings with a promise that we would immediately return with another 1000 shillings. As the day progressed , Sylvia's temperature seemed to subside but her pulse rate was very high. She sat with me for a very long time and eventually fell asleep in my arms. She slept for a long time and Megan took her from me until eventually one of the teachers took her into the classroom and laid her on a mat where she slept peacefully. When she woke up she refused to drink and would not eat her lunch, but after a while Gertrude brought her some tea and told her that if she drank it she could have a cake and we were all excited because that it what she did. Still we could not make her smile and I don't think I have ever seen such a sad little face - a face which said so much about her young life, - no love, no affection, beatings, hunger and loneliness. This little soul was empty inside and simply had nothing to smile about and it ripped into our hearts like you would not believe - how can this be in this day and age? But do you know what is even more tragic than Sylvia? 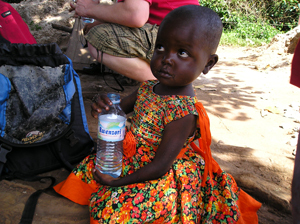 In Africa there are tens of thousands of children just like her and as much as we would like to we can't help them all. But that is why we are here. Through BBF we can make a difference to just a few and that surely has to be better than doing nothing at all. As for Sylvia, well for a few days we were able to give her some love and a very brief feeling of security but I doubt that she has a future. Those at Bukeka will do their best but I seriously doubt that next time I visit she will still be with us but when I get home and have "one of those days" I shall think of her and count my blessings that my grandchild, due in June may not have everything they want but will never know what it is like not to be loved and wanted which is a basic human right.